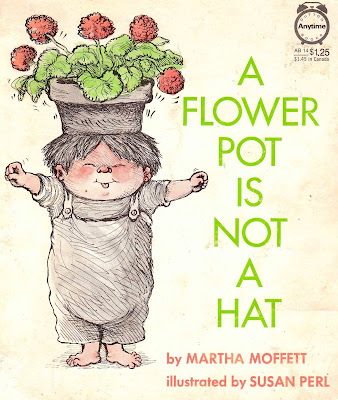 A flower pot is not a hat. A lamp shape is not a hat. A frying pan is not a hat. If I put it on my head it is. Yes, a typewriter is not a chair and a coffee pot is not a drum, but with a little imagination, anything is possible. If I can sit on it, pound it, ride on it, sleep in it, play with it, and put it on my head, then I can find out what it is by myself. Not enough of us take this notion into adulthood, but I'm personally making it my mantra. I am three years from forty and you only have one life, right? Thanks for choosing this book today -- I was recently thinking about the Healthtex ads I used to love as a child. Full page, color ads in the NY Times Sunday magazine. My father and I would study them together, noticing every tiny bird and ladybug. 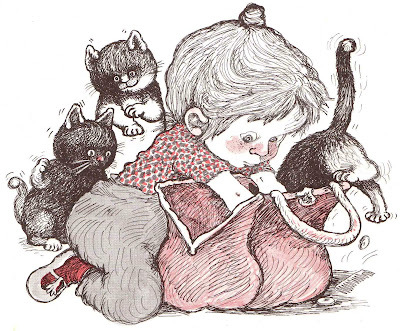 And now I know they were drawn by Susan Perl! 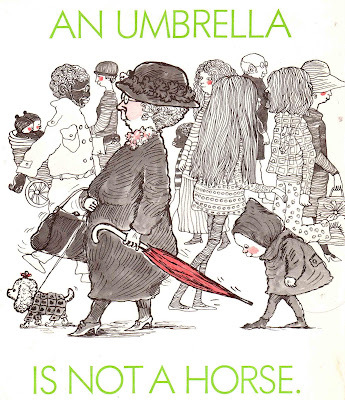 This book reminds me of a precursor to todays book "Not A Box" which we love. 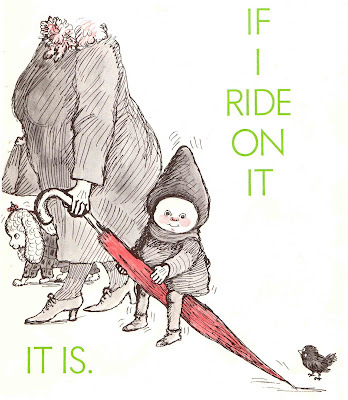 Maybe I'll run across a copy of this one in my in-laws vast pile of vintage books. The Healthtex ads apparently go back to the 1950s...I found this wonderful one on a Flickr photo stream. that health tex ad is awesome. that would make a great print or childs t-shirt. if anyone finds any more, let me know. Oh, another one to keep an eye out for. Don't remember seeing this one -- love the idea of it! 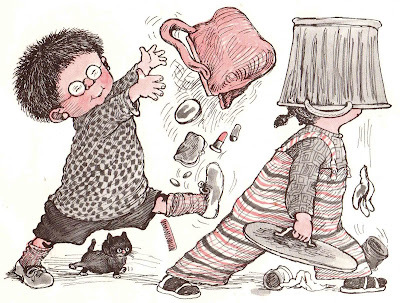 Susan Perl's "Too Many Bozos" was one my first reads as a budding reader in the 1970s. Her drawings still fascinate me. My 6YO daughter read this to me tonight. It's one of my childhood favorites. My copy is dated 1974 when I was three.